Don't forget my valued reader, that coming up soon are the returns from their mid-season breaks of The Walking Dead, The Talking Dead, Comic Book Men, & Spartacus: War of the Damned. Anyone who knows me, knows I'm pretty taken by The Walking Dead. And things in that series are really starting to heat up, now that The Governor's daughter is dead. No, as in really dead... not moving, grunting or ambling dead. And he's discovered the prison, and soon, we'll see how things get as the Gov confronts the challenge of the prison. Then there's the gore-filled Starz series, Spartacus, heading into its final season on the network. 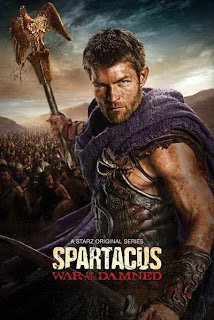 The season is titled Spartacus: War of the Damned. Despite the obvious amount of gore and skin in the series, the dramatic underpinnings of the series has my attention and I look forward to the closing series finale. This show returns January 25th. The series' third season returns February 10, 2013, with the final eight episodes. 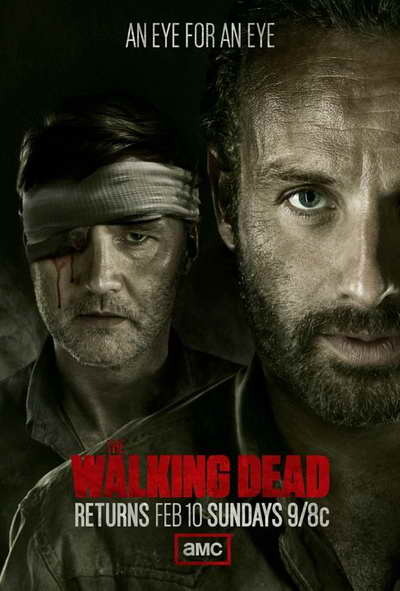 The series is based on the comic book series written by Robert Kirkman and tells the story of the months and years that follow after a zombie apocalypse. It follows a group of survivors, led by police officer Rick Grimes, played by Andrew Lincoln, who travel in search of a safe and secure home. Shot on location in Georgia, the series also stars Norman Reedus as Daryl, Laurie Holden as Andrea, Steven Yeun as Glen, Lauren Cohan as Maggie, Chandler Riggs as Carl Grimes, Scott Wilson as Hershel and Melissa McBride as Carol. As previously announced, David Morrissey (The Reaping, The Other Boleyn Girl) joins the cast this season as The Governor, the leader of Woodbury, a small settlement of survivors who becomes the chief antagonist for Rick Grimes and his group, and Danai Gurira (Treme, The Visitor) joins as Michonne, a mysterious woman armed with a sword and whose character is a fan favorite from the comic book series. Following "The Walking Dead" will be the return of AMC's unscripted series "Talking Dead," hosted by Chris Hardwick (Nerdist) which will expand to a one-hour program when it returns in February. The series is AMC's first live after show that serves as a platform for discussion for "The Walking Dead." "Talking Dead" features Hardwick spending time with fans, actors, producers and TV enthusiasts, recapping the most recent "Dead" episode, providing sneak-peeks and discussion of upcoming episodes and taking questions and comments from viewers. Fans may continue to engage with the after-show following the on-air conclusion, online, at amctv.com for more conversations, questions and trivia. "Comic Book Men" returns for the second half of the season on Thursday, February 14, on AMC's new programming night for its original unscripted series with season two's final 8 half-hour episodes. Executive produced by Kevin Smith (Clerks, Chasing Amy), Charlie Corwin's Original Media (LA Ink, Storm Chasers, Swamp People) and Elyse Seiden (Red State), "Comic Book Men" follows Smith and his crew of fan boys turned pop culture experts who live, work and breath comic books. In the new season, which premiered October 14, the guys of Smith's iconic comic shop, Jay and Silent Bob's Secret Stash, geek-out over rare memorabilia and discover treasures of the comic collecting world. Realize your inner superhero and satisfy your fan boy fantasies by watching Smith, Walt, Mike, Bryan and Ming tape their outrageous podcasts where they tackle the burning questions all fans grapple with: what is the ultimate superpower and how best to relive the nostalgia of your childhood. "Spartacus: War of the Damned" takes place following the defeat of Roman commander Gaius Claudius Glaber. Spartacus and his men have amassed major victories against the Romans after the Battle of Vesuvius. These victories have not only forged the legend of Spartacus, but have greatly increased the ranks of the rebellion slaves to more than 30,000. Rome is indeed beginning to tremble at the threat Spartacus now represents. "Spartacus: War of the Damned" sees the return of Liam McIntyre (Spartacus), Manu Bennett (Crixus), Dustin Clare (Gannicus), Dan Feuerriegel (Agron), Cynthia Addai-Robinson (Naevia) and Ellen Hollman (Saxa). This year, Todd Lasance joins the cast as Gaius Julius Caesar, along with Simon Merrells, who will play Marcus Crassus and Anna Hutchison as Laeta.